The City of Moonee Valley commissioned Kylie Grinham of Fenchurch Studios to spend a morning capturing some of the activities that local school children engage in as part of their Sustainable Schools Program. Some of these activities include creating veggie and herb gardens, learning how to camp and put together a tent, examine nature, composting, water recycling and re-use and keeping chickens. 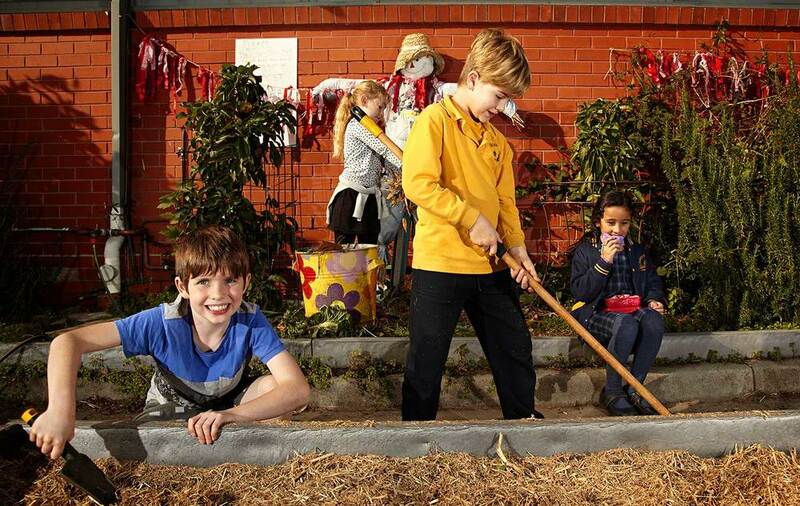 The students at Moonee Ponds West Primary School use their lunch break to help maintain or just enjoy eating their lunch in their schools veggie garden area. One of the best scarecrows around, at Moonee Ponds West Primary School. Students at the Aberfeldie Primary School regularly learn how to develop outdoor survival skills including camping and examining flora and fauna as part of their outdoor learning program. Students at Keilor Heights Primary School have a series of colourful veggie and herb patches which they have created and regularly maintain.